Burritos are just about the perfect meal. They are cheap and filling and usually represent the major food groups. Put together with the right ingredients they are delicious. Only a handful of restaurants and food carts in Portland serve perfection in a tortilla, perhaps because we’re far from the border or because most the really good places have yet to become mainstream (I suspect the latter). Given the perfect burrito is hard to find in the state I now call home, any Blue Palate visit to California must include a stop at a taqueria. I always find time to lunch at Pepe’s off Stony Point Rd. in Santa Rosa, CA. 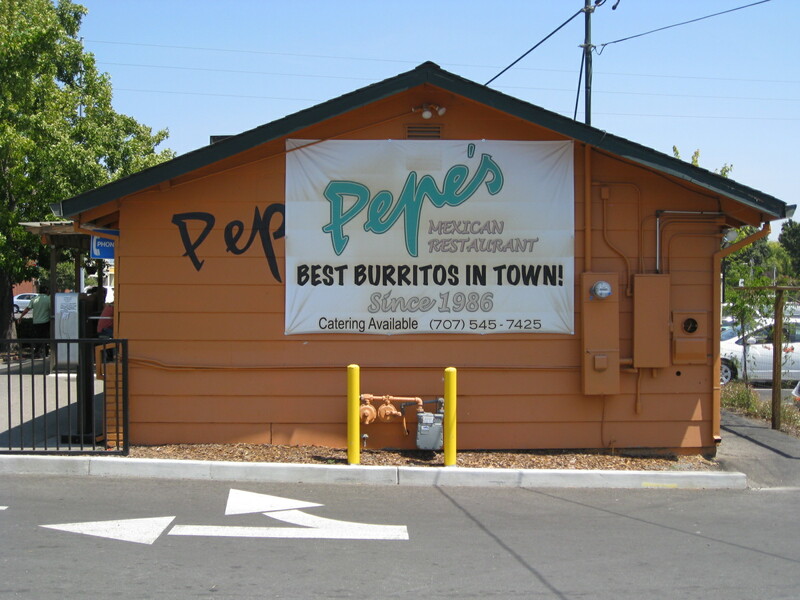 Pepe’s is a tiny Mexican food shack on the corner of a busy intersection, on the edge of Santa Rosa’s largest Hispanic neighborhood, easy to miss among the mega food stores, fast food joints, and gas stations. Some out-of-towners might mistake it for just another hole in the wall. On the contrary, Pepe’s boasts “The Best Burrito in Town.” I don’t doubt it. If you happen to find yourself at this farming community hot spot, be sure to try their carne asada burrito. The carnitas are tangy and crispy, the tortillas made by hand. My husband Peter and I did lunch Blue Palate style and shared a burrito and two tacos, and loaded up on salsas and marinated jalapenos from their plentiful salsa bar. Perfect food. So, burrito lovers: Where do you find perfection?